With this Astra Vauxhall has tasked itself to take the brand upmarket. The trend for adding a greater amount of actual and perceived quality in mass market cars is now well and truly established. The Astra also boasts a more comfortable cabin, more interior space, a keener drive and greener engines. In Sports Tourer form, the car offers buyers a spacious load bay to rival that of much larger cars. It is no coincidence that Vauxhall's Astra borrows heavily style-wise from its larger Insignia cousin. A deliberate attempt to push both cars - especially the Astra - further up the quality ladder, volume cars from Skoda, Volkswagen, Honda, Toyota and the like have in recent years offered buyers near-executive levels of fit and finish for sensible money and Vauxhall want's a piece of the action. Vauxhall's engineers have focused on both quality and the driving experience with the Astra Spots Tourer. The result is a pleasing blend of agility and comfort - think Ford Focus with the car's occasional over-firm edges rounded off. IN estate guise, the Astra is also a practical car. Offering a genuinely useable load bay complete with easy folding rear seats, Vauxhall's load-luger is something of a glamerous workhorse. This Astra earns the right to be called 'new' as much effort has gone into increasing occupant space without adding wasteful extra kilos or centimeters. The chassis has been developed to deliver a sophisticated ride over a multitude of challenging surfaces - especially poorly surfaced British roads. Along with new or greatly improved petrol and diesel engines, engineers have worked hard to ensure the Sports Tourer is equal to its hatchback counterpart and, under the skin, a lot has been changed to ensure its ease of use. 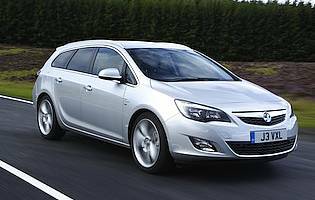 It's in the competitive company car market that the Astra Sports Tourer is required to work the hardest. The consumer-orientated equipment (sat-nav, enhanced audio units, a plethora of trim options) are very nice, but the car must also make sense to demanding fleet managers. The aforementioned cleaner engines will certainly help the car's cause, as will the more comfortable cabin and modest running costs. Also, the Sports Tourer's practical load bay puts it ahead of more expensive and less accomodating rivals. Vauxhall has transformed the once dowdy image of the load-lugging Astra into something desirable and enjoyable to drive. This version offers a sensible middle ground in terms of comfort, refinement and handling dynamics. It also looks good and can be had with a vast array of useful standard and optional equipment. 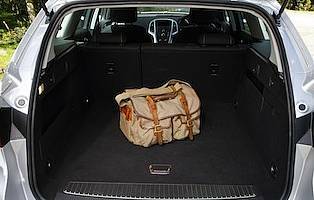 This Astra Sports Tourer delivers a rounded performance for anyone seeking a stylish, compact yet versatile holdall. Like so many compact estate cars, the Astra is unlikely to break the bank. With a range of new or improved engines boasting cleaner emissions and lower fuel consumption, tax and general running costs should be the same or better than its predecessor, while servicing will hopefully only of the scheduled kind. All this should appeal to both company car drivers and private buyers alike. As a family car there are enough cabin storage areas for the usual assortment of drinks, mobile phones, maps and other related clutter. 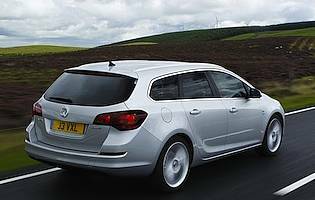 Occupant space is also good both fore and aft, while the main focus of the Astra Sports Tourer is it's boot, is a good size and should easily swallow the weekly shop or luggage for a holiday. Folding the rear seats forward requires a little effort but there's enough room for the ubiquitous furniture flat-pack or two. By and large the Astra's controls and displays are first rate. The car's main dials are clear and intuitive, the gearshift and steering slick and communicative respectively. At first glance the car's main fascia appears to be a little button-heavy. Over time the various functions become more familiar but there are better solutions out there. At least the car's main colour display is intuitive and easy to read. At first glance it's obvious that a lot of effort has been made to make occupants feel at home in the Astra's cabin. With its supportive front seats and adjustable driving position, those in the front should have a need to complain. It's a similar situation in the back, plus the available headroom should ensure that adults are comfortable on long journeys despite the estate car's sloping roofline. Also, under normal circumstances road and engine noise has been kept to a pleasing minimum. There's nothing earth-shattering here; the standard remote central locking and immobiliser package is present, and in the real world is ideal for a car like the Astra. A sturdy parcel shelf hides belongings in the boot from prying eyes, while a steering lock can act as a low cost visible deterrent for the casual thief if you want to suppliment Vauxhall's defense mechanisms. No complaints here - the Astra is fully equipped with all manner of airbags and electronic stability aids. Vauxhall's engineers have been keen to stress that while the stability aids are a good thing, they've been tuned so as not to act like an overenthusiastic nanny - a good thing if you like driving. This Astra is an altogether more 'sorted' experience than its predeccessor. For the keen driver, Vauxhall concentrated hard on improving suspension and steering feel, while for everyone else the car's ride is supple and the engines are quiet unless provoked. The 1.7 CDTi range of diesel units perform well and have been designed to appeal to company car drivers. A 1.4 turbo petrol engine offers low CO2 emissions plus a respectable turn of speed. Vauxhall's own Zafira or any other mid-size people carrier might be a better option, but the Astra Sports Tourer should prove acceptable for a growing family. There are no fancy folding seats or underfloor storage areas, but the basics are present: Isofix mounting points, ample oddment storage, affordable running costs and the all-important rear load bay. Cars like the Astra might not be as trendy as, say, a Mini, but Vauxhall's compact load-lugger is easy to drive and, assuming a low cost model is chosen, shouldn't prove expensive to run. Parking is straightforward and visibility is good, making this Astra a straightforward choice if you need more space. Vauxhall's products have experienced both highs and lows in popularity in recent years. This Astra, plus the Insigna, have been purposely designed to deliver a more upmarket experience. The work has largely paid off, and the Astra displays a cabin ambience and ride more akin to something from Toyota or Honda. In Sports Tourer form the Astra presents no problems for front seat occupants. The slightly raised seating position is a welcome bonus, while those in the back don't suffer the same hardship as some rivals - access and egress is surprisingly good thanks in part to wide opening doors and a gently sloping roofline. At the back, the car's tailgate proves easy to raise and lower and there's a low load lip, too. The Astra's centrally located display screen is most useful, although the many buttonsbelow can prove a little confusing at first. Thankfully the steering wheel mounted controls are more intuitive at first glance. Various inputs (MP3 player, iPod, Bluetooth phone) are available depending on the model, as is an easy to use sat-nav system. Despite the Astra's bold appearance, all the available external hues flatter rather than cause any negative effect. In a bid to become better know as a producer of high quality cars, Vauxhall has given the Astra a dark cabin in a similar vein to its classy German rivals. Thankfully, the subtle trim accents help lift the somber ambience and there's some rather tasteful backlighting, too. The car's steering is pleasingly light at low speeds, and all-round visibility is surprisingly good for a car with sizeable window pillars - even at the rear. Where fitted, parking sensors make life easier. Overall, being a car of a moderate size parking shouldn't cause any problems - even for novice drivers. Petrol engine options - 1.4-litre (100bhp, 140bhp); 1.6-litre (115bhp, 180bhp). Diesel engine options - 1.3-litre (95bhp); 1.7-litre (110bhp, 125bhp); 2.0-litre (160bhp). Transmission options: five and six-speed manual gearbox plus six-speed auto (1.6 petrol) depending on model. Trim levels: ES, Exclusiv, SRi, SE.